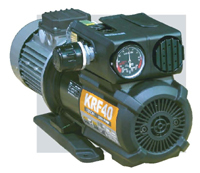 Dry vane rotary vacuum pump-compressor. maintenance free and quiet operation. Standard motor is 208-230/460 volts, 3 phase. Optional motor is 115/230 volts, 1 phase, at an additional cost. Please inquire.